This was actually a special Million issue of Interzone which appeared as Interzone #51, September 1991, although the contents owed more to Million than to Interzone. 6 · Throwing People to Stories [Terry Pratchett] · Brendan Wignall · iv; Talking to the man who created the hilarious Discworld. 13 · Slightly Foxed: Ancient Images · David Langford · cl; subtitled Musing on images from Captain W.E. Johns and Enid Blyton. 14 · Into the Mainstream? [J.G. Ballard] · Richard Kadrey & David Pringle · iv; After Empire of the Sun comes The Kindness of Women. 21 · Beyond the Berlin Wall · Daniel Easterman · ar; Which way will thriller writers turn after the fall of the Berlin Wall?. 24 · Im Always Writing About My Fears [Anne Rice] · Katherine Ramsland · iv; Talking to the Irish-American bestseller. 31 · Waltzing Through the Genres [David Morrell] · Kim Newman · iv; Interviewing the writer who created a modern myth. 35 · Medical Mystery Tour · Susan Aldridge · ar [Robin Cook]; Examining the medical thrillers of Robin Cook, successful American author. 38 · 100 Significant Scientific Romances (Published Prior to 1950) · David Pringle · bi; written as an appendix to the second Spanish edition of Science Fiction: The 100 Best Novels. 43 · Mutton Dressed as Lamb · Toby Young · ar; A manifesto for The Modern Review, a new magazine about the popular. 45 · Ernest Bramah: Crime and Chinoiserie · David Langford · ar [Ernest Bramah]; Celebrating a cult author of yesteryear. 48 · Yesterdays Bestsellers, 5: Edgar Rice Burroughs and Tarzan of the Apes · Brian Stableford · ar [Edgar Rice Burroughs]; Investigating the enduring appeal of Edgar Rice Burroughs jungle adventures. 6 · History with Fun [Dorothy Dunnett] · Lisa Tuttle · iv; Talking to one of Britains very best historical novelists. 11 · Once Upon a Crime [Mary Higgins Clark] · Stan Nicholls · iv; The top-selling American author of spine-tingling thrillers is interviewed. 15 · Slightly Foxed: The Reader Is Warned · David Langford · cl; How many ways are there for a murderer to vanish from a locked room?. 16 · The Morbidity of the Soul · Bill Reiss · ar [Thomas Harris]; About a fashionable but reclusive author. 19 · From Art School to Writers Roadshow · Brendan Wignall · ar [Liza Cody]; Talking to a rising British crime novelist. 24 · Master of Mystery · Peter Berresford Ellis · ar [E. Charles Vivian]; The Inspector Head series by E. Charles Vivian, near-forgotten detective writer, is celebrated. 28 · Mystery Maker · J. E. Miller · ar [Seamark]; Another tween-the-wars favourite is remembered. 30 · Redneckand Proud of It [J.T. Edson] · Wendy Bradley · iv; Finding that Britains leading writer of westerns has strong views about everything. 33 · Crime versus Romance · Daphne Wright · ar; Daphne Wright, alias Natasha Cooper, tells us what its like to be split between two popular genres. 36 · Oceans of War [Douglas Reeman] · Chris Adam-Smith · iv; The creator of Richard Bolitho and other seafaring heroes is interviewed. 40 · Ouida: A Victorian Bestseller · June Barraclough · ar [Ouida]; One of the great Victorian favourites is recalled. 45 · The Simple Art of Melodrama · Guy Barefoot · ar; The blood-and-thunders of yesteryear have had a long afterlife. 48 · Classic Books About Popular Fiction, 5: The Purple Heart Throbs by Rachel Anderson · Jay Dixon · ar; A classic book about genre fiction is described. 49 · Yesterdays Bestsellers, 6: The Descendants of Robinson Crusoe · Brian Stableford · ar [Daniel Defoe]; Transporting us to a world of coral islands and blue lagoons. 54 · Novels Reviewed · [Misc.] · br; Romance, crime, horror and historicals reviewed. 62 · Just Your Average All-American Boy · Pete Crowther · br; On certain well-remembered comics of the 1940s and 50s. 6 · Adventures in Storytelling [Hammond Innes] · Stan Nicholls · iv; Meeting Britains grand master of adventure. 10 · Master of Historical Reality and Romance [E.V. 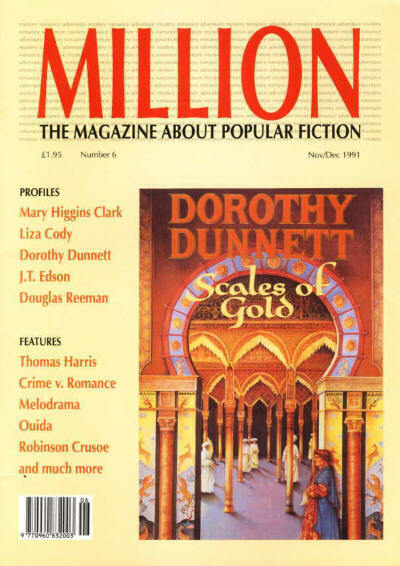 Thompson] · Mary Cadogan · iv; A leading writer of historical sagas is interviewed. 13 · Slightly Foxed: On the Twilight Edge · David Langford · cl; Does the supernatural belong in detective fiction?. 14 · Passport for a Hero [James Leasor] · Colin Munro · iv; The creator of Dr Jason Love is profiled. 18 · Prolificity · Brad Spurgeon · ar; A questionnaire was sent to the worlds most prolific writers; here is a report on their responses. 21 · Eighty Years of Romance · Jay Dixon · ar; On the history of Mills & Boon, perhaps the most famous name in British fiction publishing. 26 · Shopping and Thinking [Lisa Appignanesi] · Wendy Bradley · iv; Talking to Lisa Appignanesi, author of five Mills & Boon novels, who has now broken out. 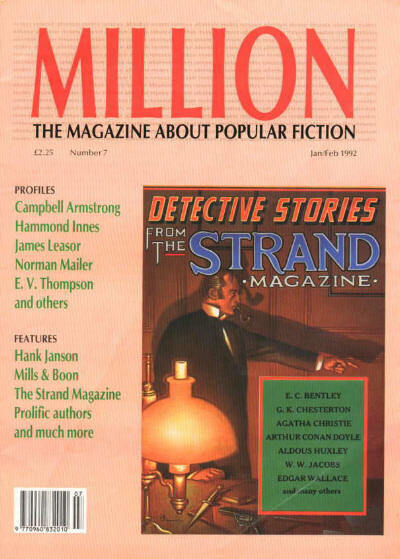 28 · Strands of Memory · Mike Ashley · ar; The Strand Magazine, original home of Doyles Sherlock Holmes and E. Nesbits Five Children, is celebrated. 32 · Leaning Towards a Primitive Socialism [Campbell Armstrong] · Ruth Eglesfield · iv; Interviewing the author of Jig, Mazurka and other dances of fear. 36 · Classic Books About Popular Fiction, 6: New Maps of Hell by Kingsley Amis · Graham Andrews · ar [Kingsley Amis]; Recalling a witty and opinionated book about genre fiction. 38 · Waiting for Mailers Big One [Norman Mailer] · Gregory Feeley · iv; The Alpha Male of American letters has written a spy novel, which should come as no surprise. 43 · Fit to Be Tied: Tales of Wells Fargo · Graham Andrews · cl [Frank Gruber]; Remembering a TV spin off book by the late Frank Gruber. 44 · Yesterdays Bestsellers, 7: Hank Janson · Brian Stableford · ar [Hank Janson]; About the post-war tough guy of British paperback fiction. 50 · Novels Reviewed · [Misc.] · br; Romance, historicals, crime, thrillers and horror reviewed. 61 · Where Theres Will, Theres the Way!, by Will Eisner · Pete Crowther · br; Reintroducing a master of the graphic-novel form. 6 · Attacking Pretensions [Tom Sharpe] · Brendan Wignall · iv; One of the great funny authors of our time is interviewed. 10 · Something Funny in the Woodshed · James Miller · ar [Stella Gibbons]; Remembering humorist Stella Gibbons on the 60th anniversary of her masterpiece Cold Comfort Farm. 12 · Clodpolls and Coots [Anthony Buckeridge] · Mat Coward · iv; Talking to the creator of schoolboy Jennings. 16 · Slightly Foxed: Gorey Stories · David Langford · cl [Edward Gorey]; Exploring the very strange worlds of Edward Gorey. 17 · A.J. Alan: The First Broadcaster · Jack Adrian · ar [A. J. Alan]; Recalling the career of A.J. Alan, Britains first great star of the airwaves. 21 · Showing You the Bullet-Holes in His Jacket [Stephen Gallagher] · Andrew Lane · iv; Interviewing a novelist and scriptwriter of menace. 25 · Classic Books About Popular Fiction, 7: Tellers of Tales by Roger Lancelyn Green · Brian Stableford · ar [Roger Lancelyn Green]; Describing a classic book about popular fiction. 26 · The Poetry of Pulp [John Harvey] · Jessica Bond · iv; A talk with poet, playwright and creator of policeman Charlie Resnick. 29 · Magnolia Blossom and Whiplash · Andy Sawyer · ar; Investigating the steamy slaver novels of Kyle Onstott and Lance Horner. 35 · Wild Scenery and Romance [Elizabeth Buchan] · Stan Nicholls · iv; She bears a famous surname, this writer of new wave romances. 38 · A Very English Writer [Robert Barnard] · Martin Edwards · iv; An interview with one of the best and most humorous detective novelists in Britain today. 41 · Hall Caine: Prince of Romantic Novelists · Vivien Allen · ar [Hall Caine]; Recalling the Manx bestseller, an exceedingly famous name at the turn of the century. 46 · Yesterdays Bestsellers, 8: Raymond Chandlers Mean Streets · Brian Stableford · ar [Raymond Chandler]; Prohibition, H.L. Mencken and the rise of the private eye - all are linked together. 51 · Novels Reviewed · [Misc.] · br; Romances, fairy stories, crime, thrillers and horror reviewed. 62 · Comicbook Verité · Pete Crowther · br; Celebrating the achievements of Stan Lee, master of comic books. 6 · Everybodys Different, Nobodys Perfect, and We All Die [Rosamunde Pilcher] · Jay Dixon · iv; An interview with the bestselling author of The Shell Seekers. 10 · Profit from Experience [Ted Allbeury] · Katy Fletcher · iv; Britains veteran spy novelist, in conversation. 14 · Slightly Foxed: The Rest of Chesterton · David Langford · cl; Compiling the ideal anthology of G.K. Chestertons stories. 15 · Murder by Gaslight · Peter Lovesey & Alanna Knight · ar; Two of the leading writers in the intriguing sub-genre of Historical Mysteries, compare notes. 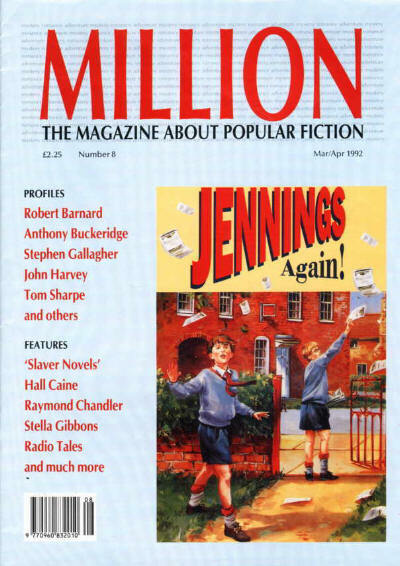 19 · Jeffrey Archer · Gordon Wells · iv; The first of our new mini-interviews features Britains most famous bestseller. 20 · Doc Biggles Drummond TemplarWhen He Was a Boy · Graham Andrews · ar [Philip José Farmer]; The Man of Bronze is back, and the first of his new adventures has been written by none other than Philip Jose Farmer. 24 · Of Sequels and Prequelsand Sequels by Other Hands · David Pringle · ar; Attempting to get to grips with an ever-growing phenomenon. 27 · This Side of the Rainbow [Geoff Ryman] · Kim Newman · iv; An interview with Geoff Ryman, author of a moving new novel about Dorothy and Toto (and Judy). 29 · The Lumber Room of Memory [Catherine Aird] · B. J. Rahn · iv; A leading detective novelist tells about her lumber-room of memory. 36 · Iris Gower · Gordon Wells · iv; The popular Welsh saga-writer is the subject of our second mini-interview. 37 · The Pat Hobby Stories, or Boil Some WaterLots of It · James Miller · ar [F. Scott Fitzgerald]; Taking a nostalgic look at some of F. Scott Fitzgeralds most entertaining stories. 38 · 70 Hollywood Fictions · James Miller & David Pringle · bi; The movies, movie-makers and movie myths have inspired many tales. 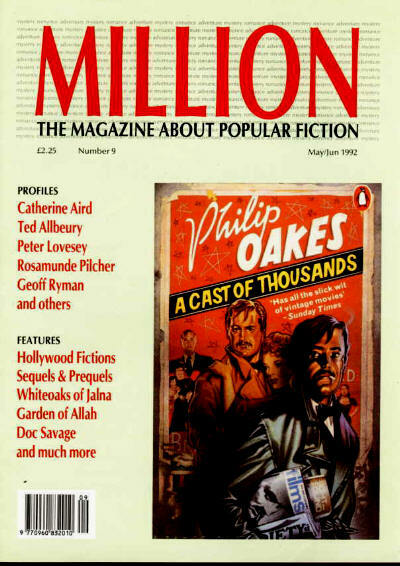 41 · Classic Books About Popular Fiction, 8: Fiction and the Reading Public by Q.D. Leavis · Andy Sawyer · ar [Q. D. Leavis]; Re-assessing one of the earliest books about popular fiction: Q.D. Leaviss famous tirade against bestsellers. 43 · Mistress of Jalna · June Barraclough · ar [Mazo de la Roche]; Recalling one of the most popular of all multi-generation sagas. 50 · Yesterdays Bestsellers, 9: Robert Hichens and The Garden of Allah · Brian Stableford · ar; On yesterdays bestseller Robert Hichens. 54 · Novels Reviewed · [Misc.] · br; Romances, crime, thrillers and horror reviewed. 62 · Gang Warfare (or Come the Resolution, Brothers...) · Pete Crowther · br; On the Justice League of America and other costumed teams from the great days of comic books. 6 · Daughter of Champions [Juliet Dymoke] · Mike Ashley · iv; A leading English historical novelist is interviewed. 10 · Saints Alive! · Peter Lovesey · ar [Leslie Charteris]; Talking about the creator of the Saint. 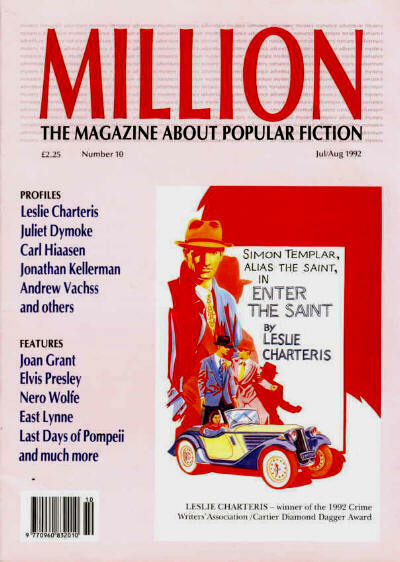 13 · The Saint on Film and TV · Guy Clapperton · ar [Leslie Charteris]; Tracing that debonair heros career in film and television. 17 · Living in the Belly of the Beast [Andrew Vachss] · Pete Crowther · iv; Meeting one of the oddest and most controversial of current American crime novelists. 21 · Jessica Stirling · Gordon Wells · iv; In the third of our mini-interviews, we question a leading romantic saga-writer - who turns out to be a man. 22 · Ice the Deli Man [Jonathan Kellerman] · Peter Garratt · iv; The American psychologist and crime writer is interviewed by a fellow psychologist. 25 · Fictional Elvis [Greil Marcus] · Julian Stringer · iv; Talking to Julian Stringer about the fictional career of Elvis Presley. 30 · A Stout Fellow · David Langford · ar [Rex Stout]; The orchid-loving, gourmet detective is making a comeback; looking at some reissued novels by Rex Stout. 33 · The Case Against Disney World [Carl Hiaasen] · Ruth Eglesfield · iv; Talking to Carl Hiaasen, an interesting new American crime novelist. 37 · East Lynne at the Movies · Guy Barefoot · ar [Mrs. Henry Wood]; Mrs Henry Woods tear-jerker has had a long afterlife on the screen. 41 · Tessa Barclay · Gordon Wells · iv; Another popular author is the subject of our fourth mini-interview. 42 · Fit to Be Tied: The Couch · Graham Andrews · cl [Robert Bloch]; About a little-known movie novelization by Robert Bloch. 44 · Far Seeing? · Andy Sawyer · ar [Joan Grant]; Joan Grant claimed that her historical novels were written by past selves. 47 · The Lost Biography of Henry Rider Haggard · Peter Berresford Ellis · ar [Roger Lancelyn Green]; Paying tribute to Rider Haggards biographer Roger Lancelyn Green. 49 · Yesterdays Bestsellers, 10: Bulwer-Lytton and The Last Days of Pompeii · Brian Stableford · ar; On yesterdays bestseller Edward Bulwer, Lord Lytton. 62 · The Purity of Pap · Pete Crowther · br; Finding true illustrated entertainment surprisingly close to home.